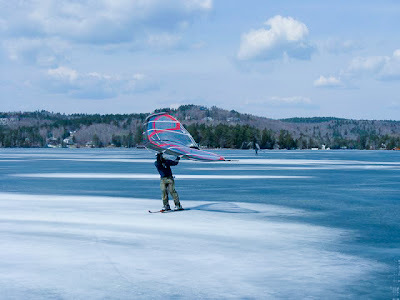 Sebastian Copeland, and his partner Eric McNair-Landry (pictured right) have just smashed the Snow Kiting world record by traveling over 595 kilometers in 24 hours. The two are currently on trek across Greenland to raise awareness for global warming. The team had experienced some bad weather that saw them pinned down in their tent for 6 straight days earlier in their expedition. Waking up the morning of June 5th they had near perfect conditions of moderate winds and good snow. After the first hour they had covered nearly 100 kilometers putting the record in reach. “Let’s go for it” said Eric and they did. 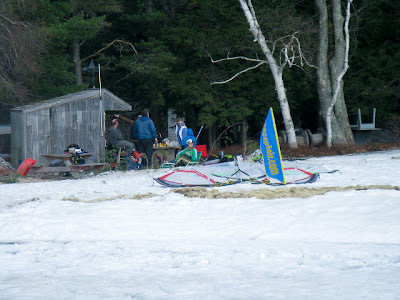 Kiting for 2 hours at a time and taking 15 minute breaks for food and hydration they continued on throughout the night. With the old record held by Norwegians Hugo Rolf Hansen and Bjørn Einar Bjartnesat standing at 518 kilometers they had a daunting task in front of them. Seventeen hours later they had the record in hand but only after having to switch to smaller kites due to the increasing winds. With muscles aching and 5 more hours of kiting in front of them they switched to 45 minutes of kiting and 15 minutes of resting. Sebastian (46) and Eric (25) had been awake for over 31 hours and now kiting for 24 hours straight and when they stopped to look at their GPS the reading was 595 kilometers - a new world record. The team collapsed into their tent and proceeded to sleep 13 hours straight. But sleep is something of a luxury on an expedition like this, so they rose the next day to press on. The team still has 16 days left and 750 kilometers to cover in order to make their pick up zone in Qaanaaq, Greenland. When the expedition completes they will have covered over 2300 kilometers from their starting point in Narsarsuaq. Dibutil: I wonder, what was the previous record and who set it? Simon Gill of Montreal has clenched the title of World Champion in the Kite Class for a second time! 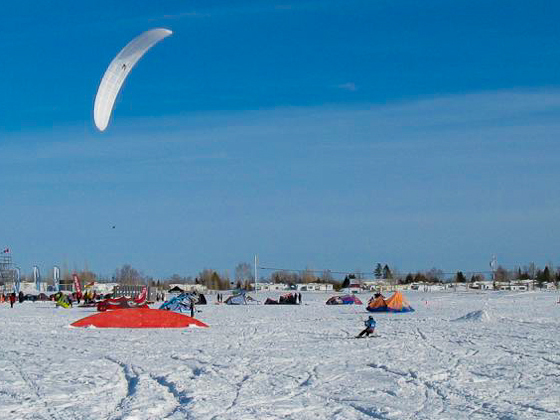 In addition, he is also the winner of the Coupe de Quebec - North America's most advanced snow kite racing venue. This is also Gill’s second time winning the prestigious Coupe de Quebec. What is interesting about this story is that after his win at Val Brilliant, Quebec in 2008, Gill seemed a shoe in to take the title at WISSA 2009 in Riga Latvia - only I knew better. Call it schadenfreude, but I was certain that the supremely talented Russian kite sailors would give Gill the competition that had been lacking in his previous victories. The cost of overseas travel prevents keeps some of the best sailors out of competition, and that is why WISSA World Championships alternate between Europe and North America each year. I knew that the talented Gill had not been truly tested going into 2009, and for me, it was fun to watch. I knew that the Russians were good, but even I was surprised at the final race results. Gill came in 10th place behind - all Russians and one Latvian (Gatis Satiks – 6th place). A less evolved competitor would have behaved badly or tried to rest upon previous achievements, but Gill reached out to those who defeated him and forged a friendship with Roman Lyubmitsev of Elf Kites. It turns out that Roman’s mother is French and Roman and Simon Gill shared the French language in common. A friendship developed, and shortly before WISSA 2010, Simon took possession of an Elf kite. Had the winds been different, (i.e. stronger!) this kite would likely not have been a factor. As it turned out, the kite was perfect. The unlikely partnership of Russian kite maker and 10th place ex World Champion turned out to be a winning formula! It just goes to show - you can’t deny talent. I just want to see what will happen next time North America’s best racer - Simon Gill, goes up against the best Russian, and European racers. With luck that - and many other compelling things will happen at WISSA 2011 to be held at Saimaa Gardens in southeaster Finland. Better late than never, Will. 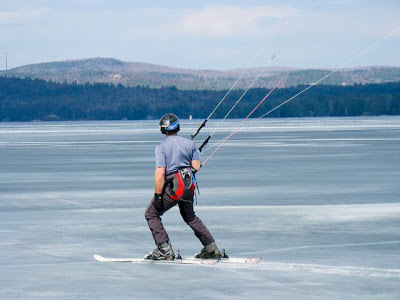 This past Saturday, Marcel Bradette, Jocelyn Marceau, and Langis Caron scored some sweet ice on Lac Jacques Cartier located in the Reserve Faunique de les Laurentides just along the route 175 that connects the Saguenay, Lac Saint Jean region to Quebec City and the outside world. The park (and lake) are about 1.5 hours north of Quebec City. 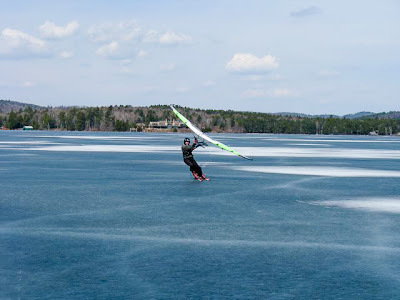 It is the altitude rather than the latitude that makes Lac Jacques Cartier one of eastern North America's most long lasting sailing venues. 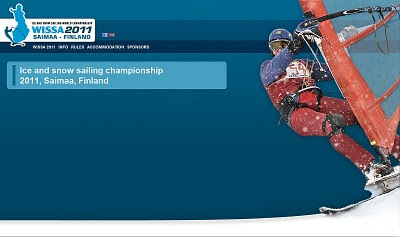 All three sailors were at WISSA 2010. It is good to see that they are still sailing when many have stopped because of abnormally warm temperatures. Purple Panic is a 10M JoJo with 70 meters of line. EVERY time it comes out - it makes drama! 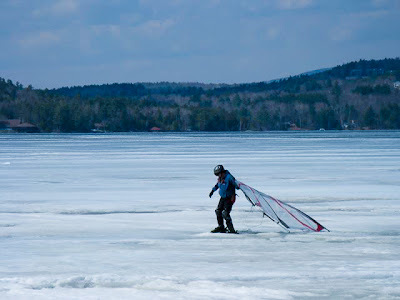 Charlie Meding shot this on Lake Sunapee in almost NO wind. Still there was drama. 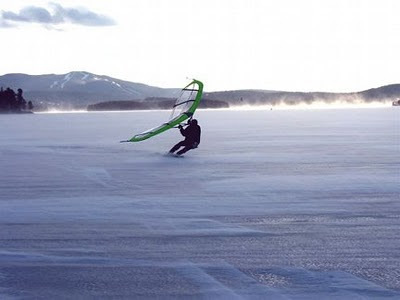 He sent the kite north while still skiing south and got ripped several meters off the ice! He landed backwards - grateful to be wearing twintips. The lines are so long that the kite can get ahead. It is flying in another atmospheric layer. The wind at the surface is almost still, but 229 feet (70 meters) above, it is still windy. You have to be careful - it is easy to get pulled into trouble with this thing. This kind of kiting is to dream about! This is 10 year old Nathaniel Montminy of St. Fulgence, Quebec. 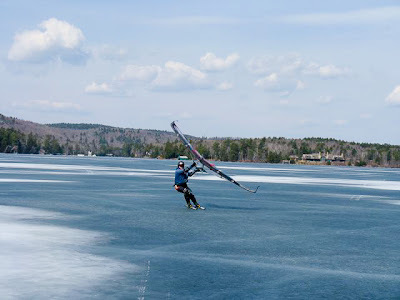 Lots of people prefer to kite with Snowboards, hence the new rating category for WISSA. As of WISSA 2010 a new category of kite racing is formed. 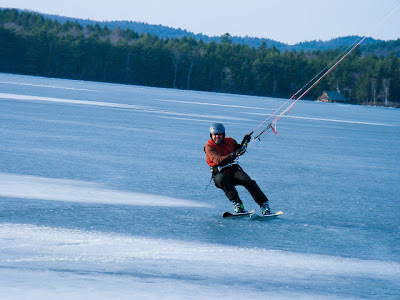 KITE CLASS Snowboards will now officially be scored in a separate category from skis. The starts will remain the same until snowboard start numbers reach an equal or greater amount. WISSA is always looking forward, and we want to be the premier destination for racing worldwide. 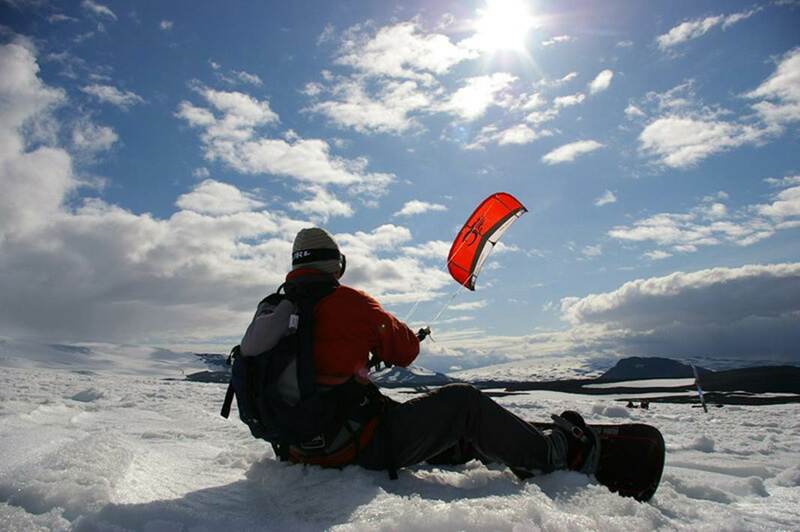 As kite snowboarding gets more and more popular, we want to extend a welcoming hand to any and all who wish to take part in international racing. 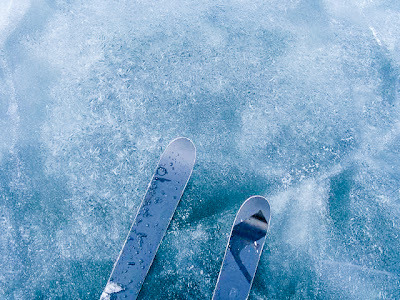 Starting with WISSA 2011 snowboards will be rated separately but start together with skis. As snowboard registrations grow, a separate start can and will be arranged. Just pulled this from a search agent. ERCIYES in Turkey. from Boulgakow on Vimeo. 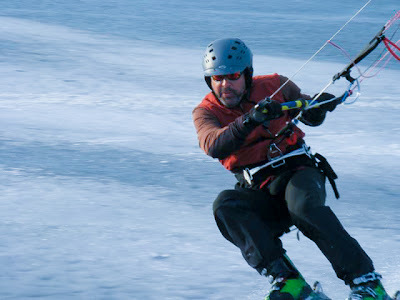 A snowkiting session in Erciyes, near Kayseri, in the turkish mountains, with Chasta and the friendly turkish snowkiters. Got to LOVE sailing on land. "here comes a tree- do I go above or below this tree?" If you thought that 2010 is over.. Think again! Because Quebec still has winter and ice and wind. Click on the banner to proceed to the event. Recent news at TheChickenLoop with some interesting discussion on the publicity of such events for the sport. Notice that the shore is not visible. 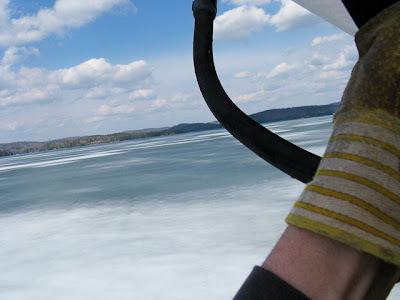 That is because Lac saint Jean is so big that you can sail away and lose sight of shore. 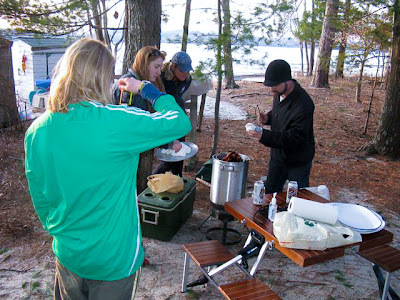 The snow conditions at WISSA 2010 were perfect. The brief period of light winds during the event were not normal. Regular winds from the west in the 30- 50 kph range came right back as soon as the event was over. SAINT-GÉDÉON, QUEBEC--(Marketwire - March 2, 2010) − The Honourable Denis Lebel, Minister of State for Canada Economic Development, today announced the awarding of $60,958 in non-repayable funding to Zone Turbulence for the 30th edition of the World Ice and Snow Sailing Association's (WISSA) Ice and Snow Sailing World Championship in Saguenay–Lac-Saint-Jean. Granted through the Community Futures program, this financial assistance will serve to help the organization promote the competition on foreign markets. 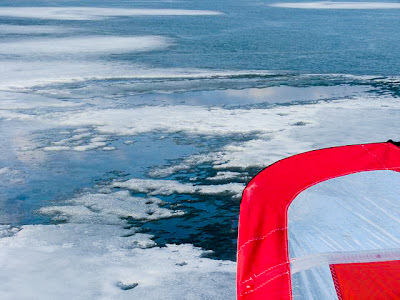 "Saint-Gédéon can be rightfully proud of playing host to the 30th Ice and Snow Sailing World Championship. This prestigious event—which draws a wide following—is an ideal opportunity to showcase the Saguenay–Lac-Saint-Jean region beyond our borders. 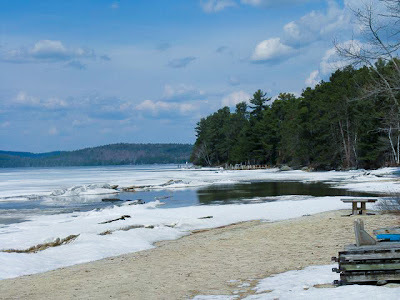 This Zone Turbulence project is sure to further the development of winter tourism in the region, which is why Canada Economic Development is pleased to lend its financial support to the event," explained the Minister of State. Hundreds of spectators and visitors, many of them from outside the province, are expected to attend the competition, generating an increase in winter tourism traffic that will benefit the Saguenay–Lac-Saint-Jean economy as a whole. 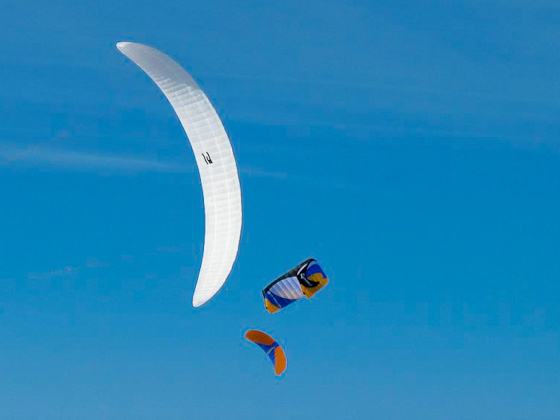 Established in April 2009, Zone Turbulence is a non-profit organization that groups together several regional associations active in the wind sports sector. 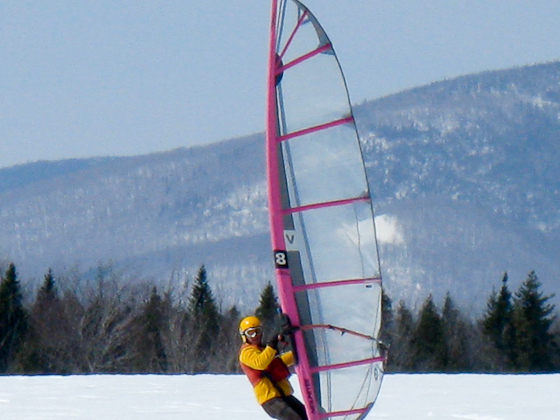 The organization's mission is to promote wind-powered sports. This year marks the first time that the Saguenay–Lac-Saint-Jean region will be hosting the world championship, which runs from February 26 to March 7 in Saint-Gédéon. Minister of State Lebel wishes the best of luck to all participants of the 30th Ice and Snow Sailing World Championship and is hopeful that the event will be held again in the region. "This competition is a great opportunity for our young ice surfers to take on an exciting new challenge and stretch their limits," he concluded. Do not expect much from the photos because copyright is important.